If you are one of the NIOS DELED untrained teachers, then you must have started preparation for NIOS exams. 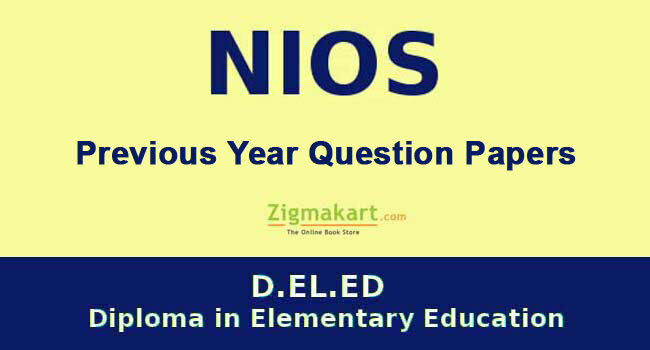 You can easily download the DELED Study Material available in Hindi and English Language on NIOS website and to help you more, we are providing DELED Question Papers. These papers can be useful for the 1st semester exam preparation. These question papers will contain 3 subject question paper for 1st semester, which are available both in Hindi and English languages. All the questions papers are created as per details given in DELED guide. There are 70 marks for each question paper. 15 Multiple choice questions (MCQs): One mark for each question. 15 Very short answer type questions (VSAs): One mark for each question. 20 Short answer type questions (SAs): 2 marks for each question. 2 Long answer type questions (LAs): 10 marks for each question. We have shared PDF download link all the question papers. Currently these are available only in Hindi and English language but soon we will share them in other languages too. Course – 501 (Elementary education in India: A socio – cultural perspective): Click here. Course – 502 (Pedagogic processes in elementary schools): Click here. Course – 503 (Learning languages at elementary level): Click here. We have also shared a Gujarati DELED Question Paper along with some important questions. With this you will get an idea of the upcoming question paper. hello, sir please upload previous year questions in odia medium….. I want guide in book in first semister.in where find the book. Thanks for provide previous.qson.papers. (First Seem DelEd. thank you so much.Its very helpfull to prepare for the upcoming exam.
. Please help me providing previous years d.el.ed 501,502,and 503s question paper with solved answer. Please Sir, I want to bodo medium question paper in exam . it will be good if it is in hindi language.. Thanks for your previous question papers for deled course. I want Nios died question paper. Where i will get the answer of questions.